I have been reading more and more about reverse osmosis water and about how it is corrosive, use of re-hardeners and calcite filters etc.. to prevent this and the taste of coffee. I thought it would be worth a small project for the Wiki. This article is relevant to people with "Tanked"/"Pour Over machines", who have an RO unit to avoid scaling their machines..so let's recap about RO water. The perception of increased bitterness is going to be down to less electrolytes dissolved in the water. It pretty much doesn't matter what these are. e.g. Potassium Chloride and Sodium Chloride both taste like salt (there might be a small difference in the degree of saltiness). If you put sugar/milk in your coffee then you won't notice anything, but for pure espresso you might. The main problem here is going to be acidity, if you can keep the pH of the water around 7.5 then you shouldn't have a problem, also corrosion is related to the Volume/speed of water flow. e.g. a pipe passing 100s of litres per day at a relatively high flow rate, vs 2 litres per day in the espresso machine at a very slow flow rate. Adding back some of the minerals that have been taken out, to improve taste and reduce the corrosive nature of RO water. This can be by a number of methods: hard water mixing, addition of carbonates etc… Unfortunately this means adding an extra in-line cartridge and more expense. That's the background and I thought that some research to see if there was a cheap and easy alternative would be worthwhile. The aim is to get to water with a pH of around 7.5 to 7.9, this is a pH level that minimises copper corrosion. It's also important that the solution does not cause scaling (e.g. addition of Calcium Carbonate). 1. What is the pH of my RO water (yours may differ, depending on it's level of dissolved carbon dioxide and other compounds prior to the RO process, but probably not by much). RO water is acidic because Reverse osmosis membranes do not remove gasses, such as carbon dioxide in water, so RO product water has the buffering alkalinity chemicals removed and the acid causing gasses remaining. Also, when RO water is exposed to the air, a small amount of carbon dioxide will begin to dissolve in the water. My Ro water has a measured pH of 6.3, so yes it's a little more acidic than my tap water, a pH of 7.6-7.7. Getting this in perspective it's not quite as acidic as milk, but, will cause more copper leeching than neutral or slightly alkaline water. As they said in the Hitchhikers Guide to The Galaxy…. 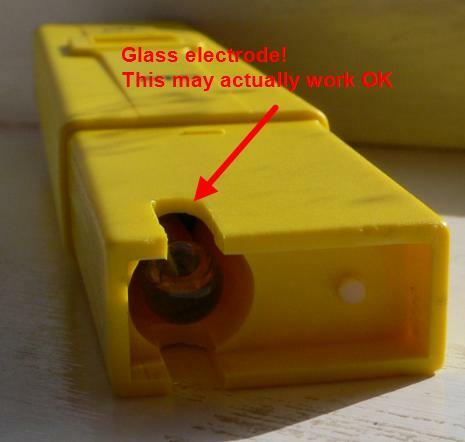 "don't panic", your machine is not going to corrode away before your eyes, or even in the next few weeks, months or years. 2. What is the pH after my normal mixing of RO with softened water or hard water from the tap? So it's not really helping enough. it effectively increases pH and acts as a buffer, pH in the level 7-8 reduces corrosion. It's dissociation products, as it breaks down on heating, are Carbon Dioxide and Sodium Carbonate. The addition of dissolved Ions should remedy any extra perceived bitterness as a result of using RO water. This really leads to a couple of important questions to solve our problem. 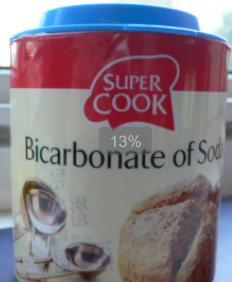 The amount of Bicarb you need to add is actually very small and in the region of 0.12g per litre or less. this is a difficult amount to measure, so here in true Coffeetime tradition is how to build a cheap Bicarb doser/measure. Take a business card (the more expensive types are better). Cut a strip 5mm wide down the length of the card. 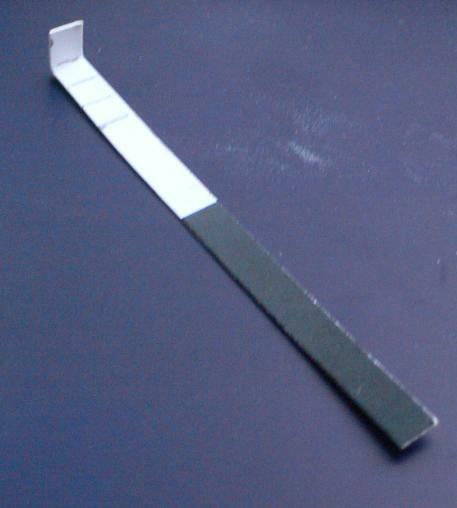 Take the small strip and mark a line 5mm in from the tip and bend to a right angle (see picture). 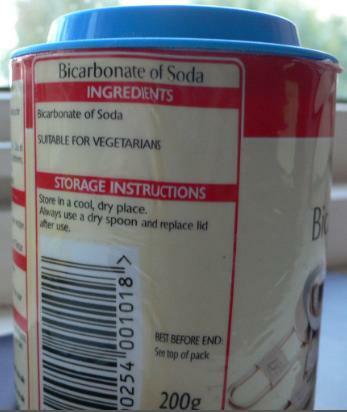 To use simply scoop out some Bicarb on the right angle bit and lift vertically out of the bicarb pot. unless you have super steady hands, you will get a pretty constant amount and roughly the same as I do. 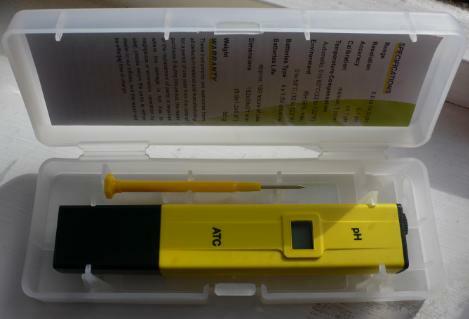 My pH meter was obtained from a Hong Kong seller on e-bay for about £14 http://stores.ebay.co.uk/LEOS-WONDERFUL-SHOP, the transaction was easy and delivery rapid. The Bicarb I am using is simply the first one I grabbed out of the cupboard, however, I am fairly sure they will all be the same (I have no shares in the company that makes the Bicarb). Ignore the 13% in the faint grey square, that was the resize in Picasa prior to me capturing the image. I hope I have my chemistry correct (it's been a long time), so any comments and corrections are more than welcomed. I hope this article helps you and of course, in my Kettle, I still use pure RO water. To see who wrote this page….please click the "HISTORY" tab shown on the lower part of the screen.